﻿ Gulf South Forest Products, Inc. » Blog Archive Gulf South Forest Products’ Haitian Humanitarian Efforts Leave Port of Mobile | Gulf South Forest Products, Inc.
After the massive earthquake that rocked Haiti on Jan. 12, some of the first cargo for humanitarian efforts left out of the Port of Mobile thanks to Gulf South Forest Products. Nearly 1,000 bundles of lumber and plywood were loaded onto the MIV ASTA on Feb. 6, less than three weeks after the natural disaster, headed to Kingston and then Port-au-Prince. “I believe we were the first to get commercial cargo in as far as lumber and plywood are concerned:’ said President John Yohanan. Gulf South Forest Products, headquartered in Ft. Lauderdale, Fla., coordinated the shipment with Foundation Maxima and Stephan Vervloet. 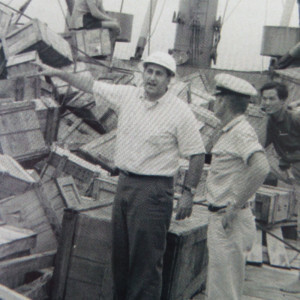 Before the quake, Vervloet ordered small quantities of wood from Gulf South Forest Products to make caskets. After the earthquake damaged his warehouse and some of his equipment, Vervloet decided to focus his efforts on building transitional housing and shelters for those left homeless. Once he confirmed that Gulf South Forest Products could supply the lumber, Vervloet raised 400,000 euros through Foundation Maxima to cover the cost of the shelters and has since built 50 to 100 houses. Another Gulf South Forest Products’ shipment of lumber products left on the MIV SOCOL 1 in mid-March with 2,500 to 3,000 bundles of lumber and plywood headed for Haiti. A portion was for Foundation Maxima’s efforts, but this time other nongovernmental organizations (NGOs) and the private sector from the United States purchased materials to build shelters as well. The vessel was also loaded with utility poles for Haitian electric companies to re-establish service to the affected areas. The Christian Alliance Network shipped two 40-foot containers of medical relief supplies on the vessel’s deck. John Yohanan said his company was pleased to be able to provide the service. in early April carrying lumber and plywood. Tri-State Maritime Services handles the loading of the vessels. As a wholesale export company, Gulf South Forest Products procures lumber, plywood and poles from various sawmills, many in Alabama, and sells the products to its customers. The majority of those customers are located throughout the Caribbean and Central America. John Yohanan said that the company’s personnel have worked with Haiti for more than 34 years and last year exported 14,000 metric tons of material to the country via the Port of Mobile. It is one of Haiti’s top suppliers of wood and lumber, so naturally the company has customer relations that proved useful in the aftermath of the earthquake. The majority of the lumber headed to Haiti came from within a 200-mile radius of Mobile. The earthquake in Haiti wasn’t Gulf South Forest Products’ first experience in disaster assistance. Years ago, when a hurricane hit Jamaica, the company was asked by the Jamaican government to ship in $8 million worth of forest products over a threemonth period for rebuilding efforts. CEO Sam Yohanan said the company was also the first to ship Alabama lumber under the USDA’s Title 1 Public Law 480 program, typically used for food subsidies, but it did include lumber for a short time. During that program, Gulf South Forest Products’ lumber was shipped to Jamaica. Gulf South Forest Products also shipped roofing sheets to a military base in Texas for the U.S. government, which were then air freighted to Jamaica. In 1997, when a hurricane struck the Dominican Republic, the company shipped in materials to help rebuild a resort and worked closely with government agencies in other building projects. Again, it relied on a network of contacts as Gulf South Forest Products is one of the leading exporters to the Dominican Republic, bringing in lumber, plywood and poles to that marketplace. “We have a reputation in the industry that we do ship on time and we fulfill our orders 100 percent;’ said Sam Yohanan. 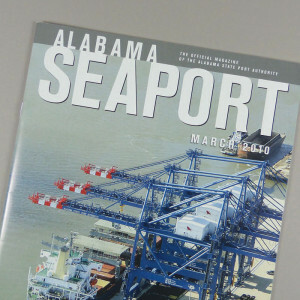 Gulf South Forest Products is the main tenant at the Port of Mobile’s Blakeley Terminal, responsible for 80 to 90 percent of the activity there, reported John Yohanan. “Blakeley is not as attractive to other customers because it has no rail line,” he explained. “We don’t do rail. It comes in by truck.We’re a good tenant for Blakeley, which has been very good for us.” Lumber from sawmills in Alabama, Mississippi, Georgia and Texas travels via truck to the Port of Mobile, then is shipped out on vessels the company charters. 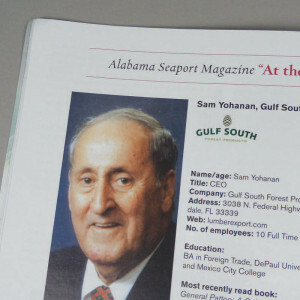 John Yohanan estimates that the Gulf South Forest Products averages 60,000 to 100,000 or more tons shipped a year. “That’s not just lumber headed to Central America and the Caribbean, but also includes containers shipped to Asia through various carriers;’ he said. 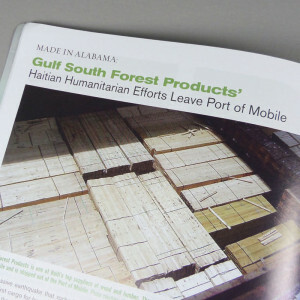 In 2009, Gulf South Forest Products shipped 600 FE Us through the ports of Mobile and Savannah. Company: Gulf South Forest Products, Inc.
What is your relationship with the Alabama State Port Authority? We have been exclusively exporting forest products from the Port of Mobile for the past 35 years. done in your professional career? I accepted a senatorial appointment as Harbormaster, Port of Saigon, during the escalation of the Vietnam conflict, 1966-1967. It was a rewarding experience during wartime conditions. What experiences in your past best prepared you for the job you have today? What single thing makes your organization stand out? The business relationships that have been developed over the years are continuing on with the next generation with the kind of confidence that only this kind of shared history can provide. down economy, what would it be? Work harder, smarter and stay focused. What word best describes your leadership style? An open door policy; aggressive with attention to delegating and mentoring. Professional pet peeve? Any and all procrastination. What do you do to relieve stress? Work around the house. If you had a $1 million windfall, you would: Start a foundation for Haitian Relief.It is 11 on Saturday morning. Where are you? What do you love the most about living in your community? What line of work would you pursue if you couldn’t work in your present one? Manage a fishing pier in South Florida. Gulf South Forest Products, Inc.